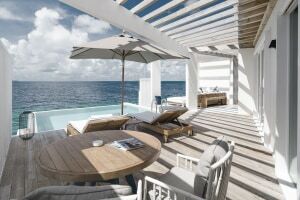 Aptly translating into 'My Island Home', Amilla Fushi offers a world-class island living experience by offering you a choice of pristine white island homes that either hover over crystal-clear waters, are nestled amongst lush treetops or on the shores of spotless white sand. 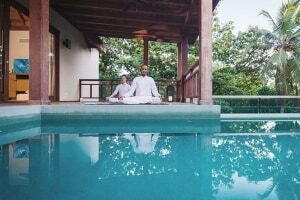 With eight on-site restaurants, a private beach area, a spa and wellness center, and plenty of luxurious amenities, this resort serve as the ideal getaway for a rejuvenating relaxation with your loved ones. You can also channelize your adventurous self by indulging in an array of activities on site or in the surroundings, such as fishing, diving, and snorkeling. Relish delicious Japanese cuisine at Amilla Fushi’s signature restaurant that’s perched atop the azure. Dine on the open deck as you watch the chefs perform their culinary magic. Savour a plate of mouth-watering Tapas in the spectacular setting. Head to the lounge bar downstairs to refresh yourself with post-dinner drinks as you groove to the DJ’s music. Feel the vibrance of the island at this beach club where dining, sports and entertainment come together to give you a magnificent experience. Take a stroll by the shops for food and drinks, photography and fashion. Games of badminton, beach volleyball and mini-futsal promise to keep the fun factor high. Explore the fine flavours of Italy with exquisite antipasti, fresh handmade pasta, meats and seafood, all of which are chargrilled to perfection. The restaurant pays homage to Piedmont, offering classic dishes infused with a Maldivian twist. Grab a glass of Piedmont red as you relax in the open-air dining area overlooking the pool. Head to the hotel’s pizzeria for a casual, laid-back vibe as you devour their wide range of steaming, delicious pizzas with an abundance of deli-style toppings. Overlooking the pool and shimmering lagoon, Joe’s Pizza is the ideal place to hang out on a lazy afternoon. End your meal with a generous helping of ice cream and sorbet in a rainbow of colours. Tantalize your taste buds with tangy Asian flavours from across the continent. Gorge on spicy Thai salads, Indian chaat, dim sums, gyoza, me goreng and more. Savour the flavours of the East with a range of noodles and soups. Pick the perfect drink to compliment your meal and conclude it with a plate of fresh tropical fruit for dessert. Enjoy a refined dining experience against a backdrop of the lovely Maldivian shores as you savour some freshly caught fish and pair it up with a fine glass of white wine. Order your seafood just the way you want it- raw, cured or cooked. Kickstart your day at this sunny breakfast spot by the pool. Fuel up with juicy tropical fruits, muesli, yoghurt, or a hot, cooked breakfast in case your day’s going to be an adventurous one. Choose to dine under the trees or indoors. Allowing you to revel in relaxation, this all-day bar is the best spot to enjoy sumptuous international cuisine overlooking the resort’s enormous infinity pool. head here for a light lunch or some exotic cocktails in the evening while you enjoy live music. With vogue interiors and panoramic ocean views, this overwater lounge offers a vast array of cocktails and mocktails with signature style. The chill vibe of this lounge lets you relax in the open-air spaces as you take in the gorgeous sunset views and groove to the DJ’s tunes till late in the night. Providing ease while you’re on your vacation, the Emperor General Store is a marketplace offering fresh fruit, bakery treats, meats and ice creams, as well as basic items for everyday use. It goes a step forward to serve as a chill spot where you can just relax with a snack and a piping cup of freshly brewed coffee. The resort houses an enormous wine cellar with over 8,000 bottles to sip and savour. Offering international drops, both Old World and New, Premium bubbly, vintage reds and rare finds, the Cellar Door invites you to a blissful experience. Choose to pair your wine with a spectacular meal overlooking the ocean, or by curated tasting with artisanal cheese and wild honeycomb. As a part of the wellness ritual offered by Bodyism, this café provides vibrant, nutritious and energising foods. The focus is on simple and unprocessed foods to contribute to one’s holistic wellness. Free of gluten and refined sugar, the Bodyism Café at Javvu Spa takes you on a delicious journey to wellness. Spend a day lazing in the enormous beachfront infinity pool as you admire the gorgeous ocean views that extend to merge with the blue skies. You could also work up an appetite as you swim laps before heading to one of the resort’s restaurants for a hearty meal. Keep a check on those calories by working out at the resort’s fully equipped gym. With marvellous ocean views, you’re sure to be motivated! 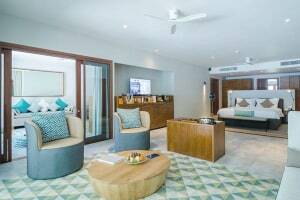 Amilla Fushi also aims to cater to the entertainment needs of your kids and that’s why they have two specially designed areas on the island for the little ones to enjoy a wide range of indoor and outdoor activities. There is also The Teens Games Area; an entertainment centre for older children up to the age of 18. It offers a juice bar, billiard table and table tennis. 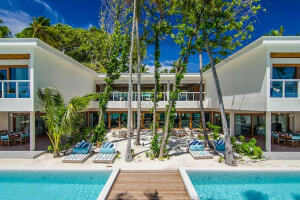 The resort is reachable via a 30-minute scenic seaplane transfer from Male International Airport or via a 10-minute speedboat transfer from Dharavandhoo Airport. All children under 2 years can use crib/cot free of charge. 1 child under 12 years can use existing bed free of charge. 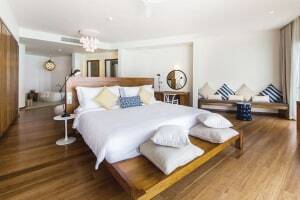 Guests can use an extra bed for an additional cost of USD 376 per person per night.